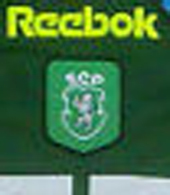 Reebok continued to be the supplier of the Sporting Clube de Portugal shirts, staying until the Centennial year in 2006. The home hooped shirt followed the style of the two previous seasons, with some evolution, namely in the collar and other small details. 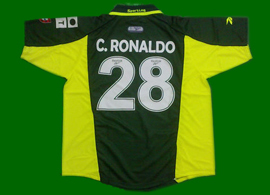 The away shirt, with a dark green central band, sided by bright yellow, is one of the least attractive Sporting Lisbon kits of the Reebok era. On the contrary, the Stromp kit was classic and noble as it always is. 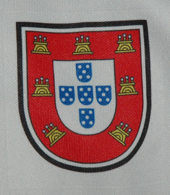 The most important distinguishing mark of the shirts of this season was that, after 18 years, the Portugal national champion patch was once again displayed on the sleeve. 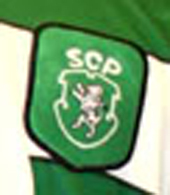 The sponsor changed to PT, in black but with a rather large size, making a square that occupied three stripes of the shirt (in the Portuguese competitions). 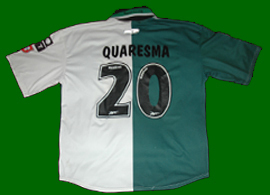 Click here to see all the Sporting Lisbon jerseys from 1999 2000. Adult shirt. Reebok, PT sponsor. 2000/2001. Personalized Cristiano Ronaldo. CR28 was very far away from playing with the main team. 2000/01, match worn shirt of goalkeeper Schmeichel. XXL, of course! 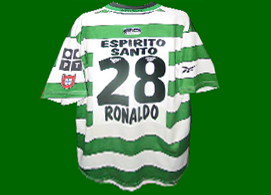 Click here to see all the Sporting Lisbon shirts from 2001 2002.